Aluminum is a reactive metal (un-noble), which should have a low corrosion resistance according to thermodynamics. The high corrosion resistance found on aluminum nevertheless, is due to the presence of a thin, compact film of adherent aluminum oxide on the surface. Whenever a fresh aluminum surface is created and exposed to either air or water, a surface film of aluminum oxide forms at once. This aluminum oxide dissolves in some chemicals, notably strong acids and alkaline solutions. When the oxide film is removed, the metal corrodes rapidly by uniform dissolution. In general, the oxide film is stable over a pH range of about 4.0 to 9.0, but there are exceptions. One of these exceptions is in environments where the surface film is insoluble, but weak spots in the oxide film leads to localized corrosion. Local corrosion can only be found when aluminum is passive, covered by an oxide layer as the one formed by anodizing. 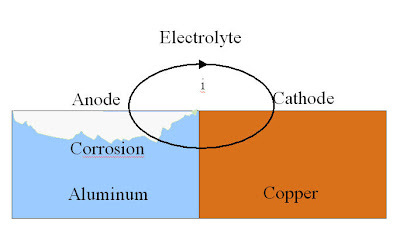 Localized corrosion has an electrochemical nature and is caused by a difference in corrosion potential in a local cell formed by differences in or on the metal surface. Galvanic corrosion is due to an electrical contact with a more noble metal or a non-metallic conductor in a conductive environment. The galvanic corrosion is very dependent of the cathode reaction and which metals are in contact which each other. The efficiency of this cathodic reaction will determine the corrosion rate. The most common examples of galvanic corrosion of aluminium alloys are when they are joined to steel or copper and exposed to a wet saline environment. The galvanic corrosion of aluminium is usually mild, except in highly conductive media such as i.e. slated slush from road de-icing salts, sea water and other electrolytes. The contact area must be wetted by an aqueous liquid in order to ensure ionic conduction. Otherwise there will be no possibility of galvanic corrosion. The galvanic series for metals shows that aluminum will be the anode of the galvanic cell in contact with almost all other metals and hence the one which suffer from galvanic corrosion. The galvanic corrosion performance of the different aluminum alloys is quite similar, so that changing alloys cannot solve the problem. There has to be an electrical contact either by direct contact between the two metals or by a connection such as a bolt. The most favourable case is a very large anodic surface area and a small cathodic surface area. The galvanic corrosion is a local corrosion, and is therefore limited to the contact zone. It is unusual to see galvanic corrosion on aluminum in contact with stainless steel (passive). In contrast contact between copper, bronze, brass and different kinds of steel alloys (passive and active) and aluminum can cause severe corrosion so it is advisable to provide insulation between the two metals. The reason for the confusion of the galvanic corrosion between aluminum and steel is that stainless steel can be found as passive or active, and if the environment contains chloride. This will change the corrosion effect on aluminum substantially. Generally, the closer one metal is to another in the series, the more compatible they will be, i.e., the galvanic effects will be minimal. Conversely, the farther one metal is from another, the greater the corrosion will be. Though prediction of galvanic corrosion is not easy. For contact between common metals, in particular steel and stainless steel, experience show that laboratory testing always leads to more severe results than what is actually observed under conditions of weathering. The photo shows galvanic corrosion after 1000 hours salt spray test in laboratory where stainless steel bolts have been screwed into an anodized aluminum block. Normally the galvanic coupling with stainless steel works very well but when there are even the slightest trace of chloride in the environment a galvanic corrosion will take place. Due to the cracking of the anodized layer when mounting, a very little area of un-noble metal (the aluminum underneath) will be in contact with a very big area of the more noble metal (the stainless steel). 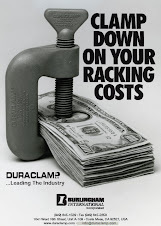 This will cause galvanic corrosion which can increase tremendously dependent on the area of the aluminum.